How many cops does it take to evict a hawk from a porch? Trick question. It actually took my bird-savvy neighbor, Jocelyn Bayes, to finally send the poor beastie on it’s way, but I’m very grateful for the cops help, too! My wife Marie and I woke up before 7:00am last Saturday morning to get ready for a contractor (the talented and helpful Larry Andreozzi) who was coming over to replace a broken window on our third floor. Imagine Marie’s surprise when she went downstairs and discovered that some sort of big bird had made it’s way onto our screened in porch and was flapping around violently. The flapping, however, was the least of it. 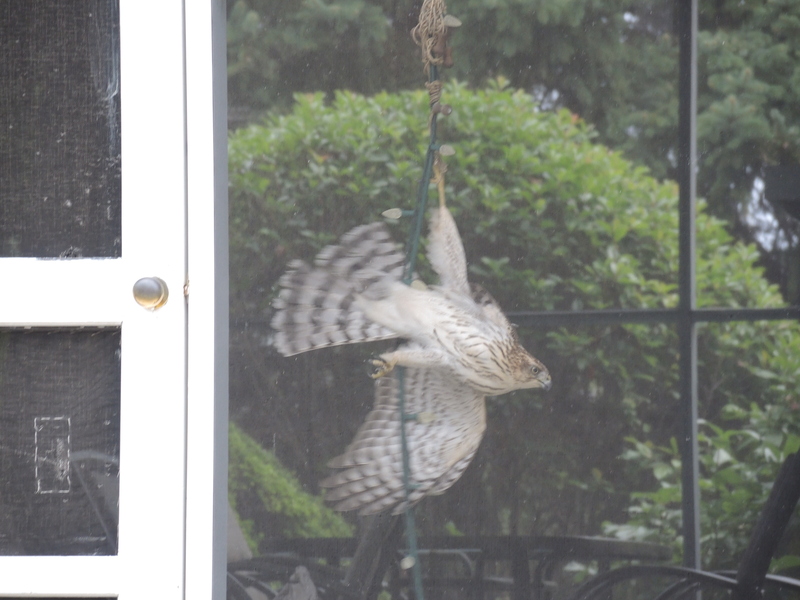 It turns out the bird was a largish hawk who had smashed straight through the screening only to get tangled up in some Christmas lights and shade pulls on the front side of the porch. When I arrived on the scene, the bird had been hanging upside down but as I approached the nearby French door, the bird went into a flapping frenzy. It must have been exhausted, but being a hawk, the chief thing it looked was steaming mad! We had no idea, of course, how long the bird had been there but it clearly needed help to get gone. Unfortunately, with Saturday morning not being the best time for any sort of emergency, a couple of calls to animal control didn’t yield anything! Our contractor had showed up by that time, however, and had a great idea: call the cops. I was a little trepidatious to do so, at first—they certainly had better things to do—but within a few short minutes, first one, then two and ultimately four separate cop cars showed up in front of our house. Apparently, Drexel Hill’s finest do indeed do birds, and they do so in force. None of us knew exactly what to do, but Larry had the idea to wrap the bird up in a big moving blanket he had in his truck so it wouldn’t be able to claw anyone while being cut free of the cords. The cops went with it. It’s a bit hard to describe what followed next but this video should give you some idea. I was holding the screen door open for the cops so my camera work is pretty shaky. Sorry! Also, the video stopped a bit shy of the bird being eventually shooed off the porch by Jocelyn (who was yielding nothing more than a towel! ), but the important takeaways are (a) the cops cut the bird free then after a bit of alarm and hilarity (b) the bird was shooed off the porch and winged it’s way away; hopefully unharmed.